Stylish, simple and sturdy with a breathable mesh back for optimum comfort. Perfect complement to Inertia Task series. Offered in a large selection of fabrics and with lifetime warranty. 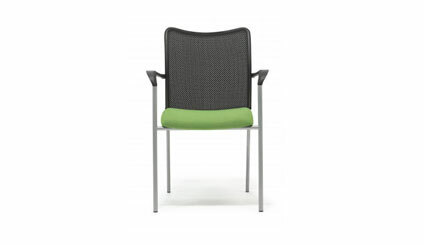 The Inertia Mesh back side chair is a perfect compliment to any office environment. The flexible contoured mesh in the back allows for breathability and comfort to any size user. I recommend these mesh back side chairs as guest seating in private offices or workstations, in waiting rooms and reception areas, cafeterias and lunch rooms, even to add to the comfort of your home office. I would even use them in a home dining room. The Inertia mesh back chair also comes in a bar height stool that can be used in any area of your home or office as well and it can be shipped directly to you. The 10 year warranty is a real plus as well!